Anytown parents who want their children to develop healthy habits know that they need to set the example. The “Do as I say, not as I do,” approach does not instill confidence in children. If we want our child to exercise, we should get off the couch ourselves. If we want our child to decide on an apple when he wants an afternoon snack, we better not be snacking on chips and cookies. If we routinely stay up until 1:00 a.m, our adolescent will probably not learn the importance of recharging their physical and mental batteries with restorative sleep. What about healthy oral habits? Do our children see us brush carefully after meals? Do our children find water bottles in our car cup holders or empty sports drink cans? Do we schedule twice-yearly dental visits for ourselves and our kids? Do we wear a mouthguard when playing contact sports? Do we floss every night? Did you know that tooth decay is the second most common childhood health problem in America – after the common cold? If you have a newborn or toddler, you have an extraordinary opportunity to establish daily habits for lifelong oral health. If every pre-teen in your Anytown neighborhood has at least a few fillings, it may seem that cavities are inevitable for Salt Lake City area kids. At Cornertown Dentistry, we don’t believe this common notion. There is much you can do to keep your young child’s baby teeth and adult teeth cavity-free. In fact, there are essential things to do even before your baby’s first teeth erupt. Remember not to put your baby to bed with a bottle. Wipe milk or formula off their gums with a soft, damp cloth after feeding. Don’t let your infant drink juice all day. If you want your baby or toddler to drink between meals, water is just fine. When should you bring in your toddler for their first dental check-up? The American Dental Association recommends that a child sees a dentist before their first tooth appears or no later than their first birthday. If your children are older and have had a lot of cavities, don’t give up. It is never too late to improve daily habits to keep teeth healthy. 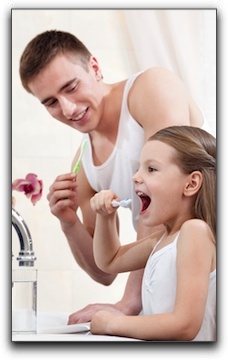 Even if your upbringing didn’t include an emphasis on oral hygiene, you can set your own traditions starting today. I am Doctor Larry Johnson of Cornertown Dentistry in Anytown. I am enthusiastic about oral health for the entire family. I advise Anytown parents about tooth development, thumb-sucking, water fluoridation, dental sealants, oral sports protection, orthodontia, and much more. My understanding dental team will make your child feel comfortable and relaxed. If you are looking for a child-friendly dentist in the Salt Lake City area, we invite you to schedule a pediatric dental appointment by calling 801.938.3466. Teeth Whitening Special – Call for details.